... but maybe a problem with Pink Floyd MS Souvenir envelope. As most people know, since last autumn, Royal Mail have been selling what we all call unaddressed First Day Covers for 3 months after the date of issue. To avoid presenting the non-philatelic population with 'jargon' products ('first day' & 'covers') these items are identified as 'Stamp Souvenir' or - in the case of the miniature sheet covers - 'Stamp Sheet Souvenir'. Meanwhile, on our website, two new pages have been added, one for the Pink Floyd issue on 7 July, and the other for the Beatrix Potter bumper bundle on the 26 July. 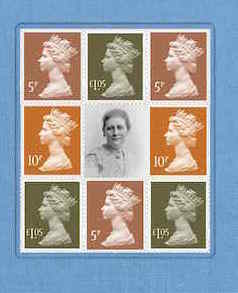 The only thing expected to be of any interest to definitive collectors is the Potter PSB, with the retail booklet expected to contain 1st class purple stamps coded O16R REIGC. The 5p, 10p and £1.05 stamps in the PSB should be coded M16L MPIL. 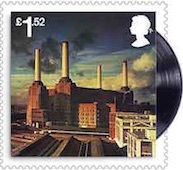 What does have 10 stamps is the gummed maxi sheet of 10 Dark Side of the Moon. If you look at Royal Mail's Pink Floyd webshop, John (see link above), you will see the product codes that I mention against those unaddressed FDCs. The Gummed Maxi Sheet is not available on cover. I've been told that the reason for the recall is that the product cited - whatever it is - wasn't postmarked. Does anyone know if the Dark Side of the Moon maxi sheet will be listed by Stanley Gibbons? Probably only as a footnote - see MS3019. Hi Ian just got off the phone from Royal Mail having tried to order the maxi sheet for Pink Floyd the response was that they have sold out as it was available as a pre order item. however royal mail have only just sent out the preview leaflet with codes on. the first day cover is also not available. there will be no further stock. interesting to see what price they fetch on ebay. Still available on their webshop, but none of the PF products is yet on their eBay shop.